Just getting started with a new Android handset? I’ve rounded up 20 apps from the Google Play app store that’ll have you posting status updates, watching videos, pinning the latest fashions, reading e-books, and checking the weather in no time—and best of all, they’re free. Rejoice, social mavens: mobile apps for both Facebook and Twitter are available for Android phones, and each will let you post updates, browse the latest stories from your pals, upload photos, and share links. Are you a Netflix subscriber? If so, get ready to start streaming. You can browse tens of thousands of movies and TV shows through Netflix’s glossy new mobile interface, manage your instant video queue, and stream videos over both Wi-Fi or 3G/4G cellular networks. Just be careful not to bust over your carrier’s monthly data limit. Yes, bookworms, you can use your Android phone as an e-reader with the mobile Kindle or Google Play Books apps, which let you download and store, and flip through purchased e-books, even when you’re offline. No need to go without free, streaming music if you’ve got one of these music apps on your Android phone. Each app serves up all the streaming tunes you can stand—albeit with advertisements. Browse, purchase, stream and/or download new and catalog tunes from Amazon’s massive digital music selection. Similar to Instapaper, Pocket (also available for the iPhone and iPad) saves and formats web pages you’ve bookmarked for mobile (and offline) reading. It’s the perfect app for Android users looking to dive into lengthy news and magazine articles on a small screen. How’s the weather out there? Both WeatherBug and the Weather Channel serve up current conditions and forecasts, plus animated radar maps, video forecasts, and webcam images from local weather stations. In addition to scanning your handset for the latest crop of mobile viruses; Lookout’s mobile security app will also track your lost or stolen Android handset, similar to Apple’s “Find My iPhone” feature. An absolute must-have app, if you ask me. Perfect for keeping tabs on your favorite blogs and news sites, the Google Reader app syncs with the free, web-based Google Reader service and even saves new articles for offline reading. Where to go, what to do … and what’s for dinner? Yelp for Android will pinpoint your location and list nearby stores, restaurants, banks, museums, hospitals, you name it. Each listing includes details like street addresses, hours of operations, and plenty of user reviews. Your most important desktop files will never be more than a swipe away with these powerful file-syncing apps on your handheld. Dropbox offers free syncing for up to 2 GB of documents and will (if you wish) automatically sync all your mobile snapshots with your other Dropbox-linked devices. Google Drive, meanwhile, taps into your online Google Drive account (up to 5GB of free storage) and adds the ability to create and edit Word- and Excel-compatible documents directly on your phone. A sleek, magazine-like mobile news reader that syncs with Facebook and Google Reader, Pulse News boasts featured sections from the likes of TIME, The Huffington Post, CNNMoney, and more. Don’t want to cough up the cash for a pricey digital magazine subscription? Build your own “social” magazine with Flipboard, an app that creates beautifully designed, magazine-style pages using stories from your favorite blogs, not to mention headlines shared by your Facebook and Twitter pals. Armed with dozens of groovy filters and frames, Instagram turns your mobile snapshots into works of pop art—and if you’re feeling social, you can share your eye-popping pics on Facebook or Twitter, or with other Instagram users. A must-have for new parents (as I’m just now discovering), Skype makes it easy for far-flung relatives with PCs, Macs, iPhones or iPads to say “hi” to baby via video chat. Also on board: crystal-clear voice calling and instant messaging. Browse all the fashions, products, food, and other online goodies that’ve been “pinned” by fellow Pinterest users, and create your own pins using the automatically installed Google Chrome “pin it” bookmarklet. Wanna see a movie? Fetch local showtimes, reviews, photo galleries and trailers for the latest box-office draws, buy tickets, or check out new movies on Blu-ray or DVD. Why settle for the browser that came with your Android phone when you could get the mobile version of Google Chrome, a web-browsing speed demon that lets you sync bookmarks, tabs, recent searches, and other settings with Chrome on your desktop. Don’t let that brilliant thought slip away; instead, jot it down with Evernote, an easy-to-use digital notebook that syncs your notes and web clippings with your (free) online Evernote account. Confounded by those blocky, black-and-white squares stamped on everything from magazine ads to billboards? Those are QR codes, and you’ll need a mobile QR reader to translate them. Enter Google Goggles, a free Android app that’ll quickly scan a QR code and reveal its secrets. Sightseers will also appreciate Google Google’s ability to cough up factoids about notable buildings, statues, and other landmarks in your field of vision. 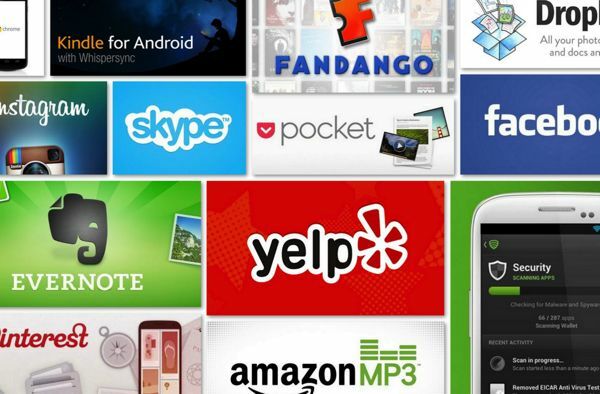 Keep in mind, of course, that these aren’t the only must-have apps in the Android Market. Have any suggestions for more? Post ’em in the comments below! Update [1/3/13]: I’ve replaced Listen, the Google podcast app that hasn’t been updated in nearly six months, with Flipboard. I’ve also added Google Drive, Pinterest, Fandango, Movies by Flixster, Chrome, Evernote, and Google Goggles to the list.